It can be expensive to fill a calzone craving on a regular basis. 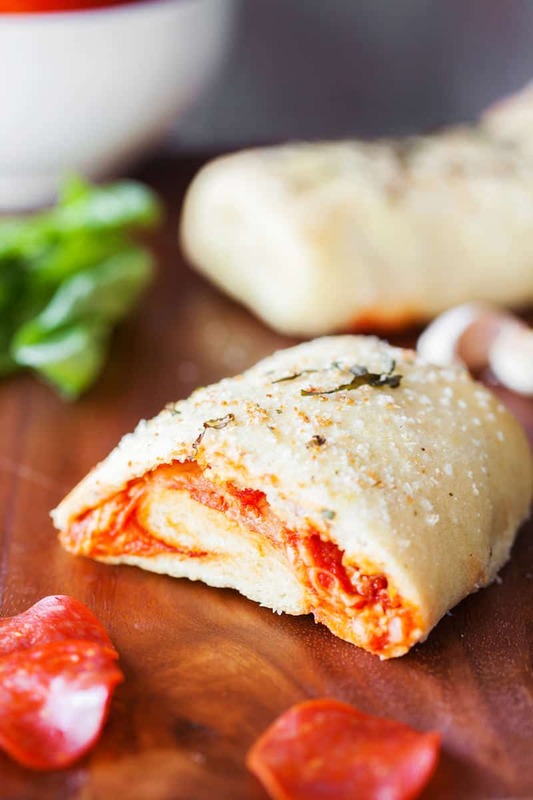 Get inspired by this calzone recipe with no yeast dough – it’s so simple and yummy! There is a restaurant down our street that makes amazing calzones. 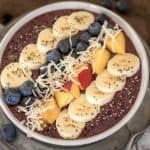 My husband loves them but it can get expensive to satisfy that craving on a regular basis. 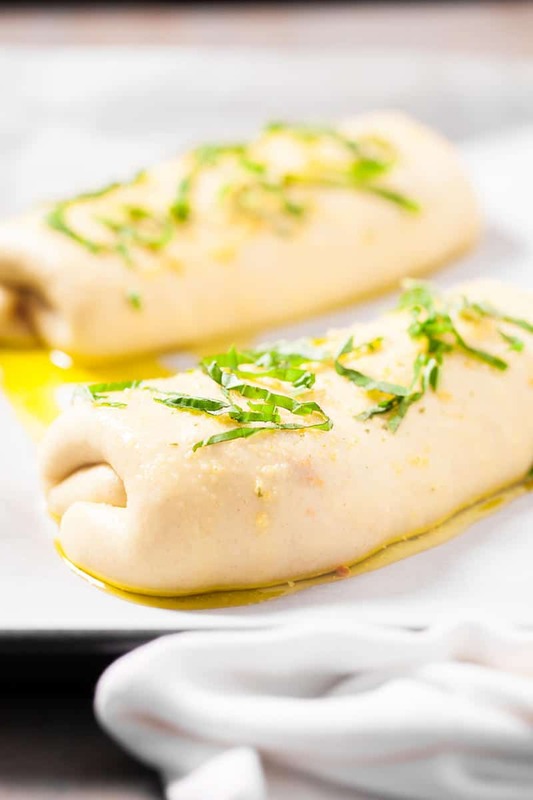 I became inspired by this no yeast dough recipe and knew I had to whip up some calzones for dinner one night. 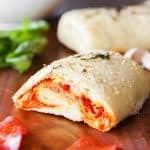 I came up with these easy pepperoni calzone recipe that anyone can make! It was so flavorful and yummy – here’s how it’s done. Mix together (in a large bowl) flour, sea salt and baking powder. Add water and mix until everything is well combined and you start to see the dough forming. If using a Kitchen Aid mixer, switch to the dough paddle. 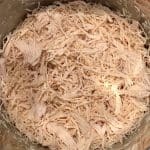 It will whip everything nicely and you’ll be left with a ball of dough at the bottom of the bowl. Knead the dough for about 2-3 minutes. 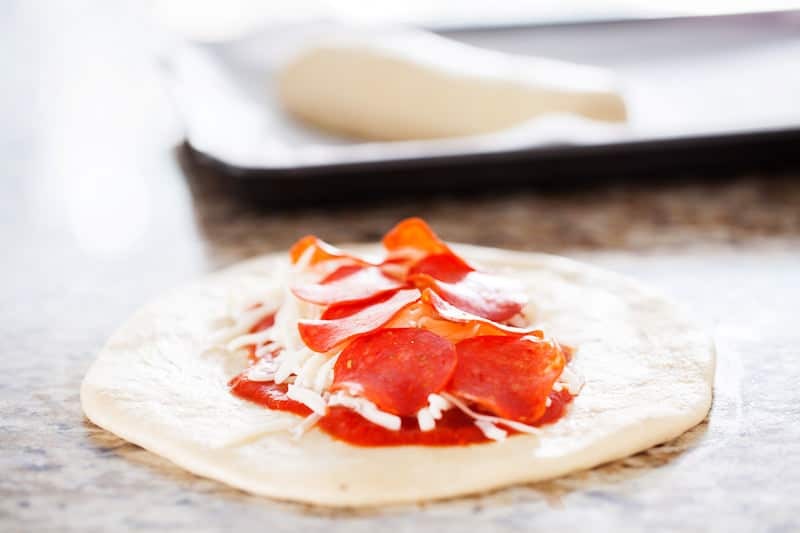 Sprinkle some flour on your surface and some on your dough. Work the flour into the dough so it’s no longer sticky. 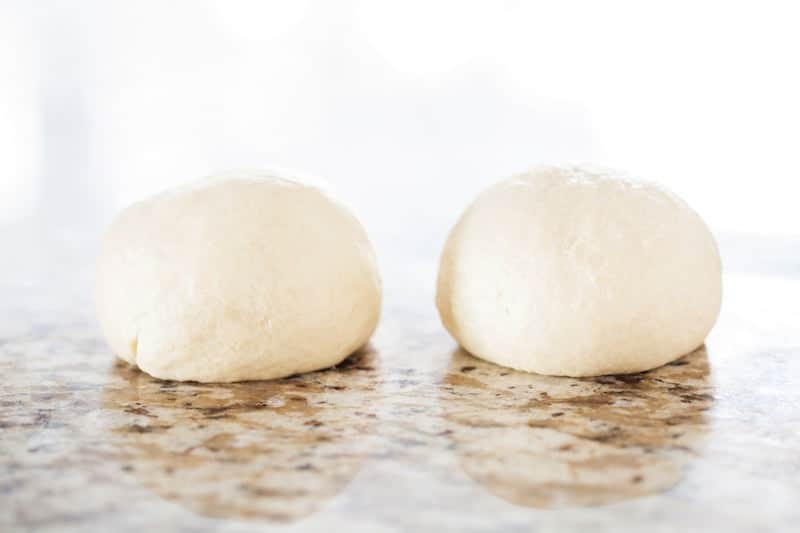 Separate the dough into two balls. Each ball makes one calzone. Using a rolling pin, thin out your dough. Roll from left to right, then top to bottom until you have a circular or shape. 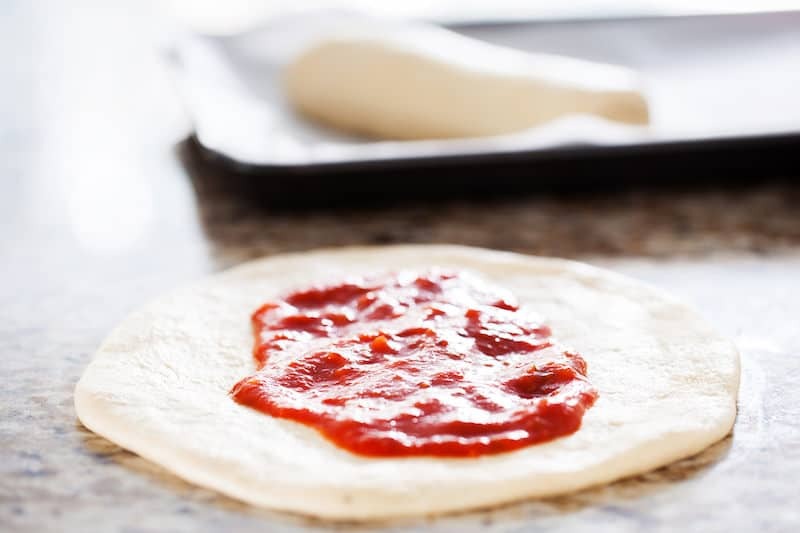 Use a spoon to spread the sauce down the center of the dough, then sprinkle with the mozzarella. Line up the pepperoni right on top of the cheese. Starting from the bottom, fold the dough about an inch over. Do the same from the top, then fold over the sides to seal the contents. In a small bowl, combine 1 tsp of oil, garlic salt and basil leaves. Brush the top of the calzone. Bake in the oven on a pizza stone at 350 degrees for 15 minutes or until golden brown. Allow to cool for 2-3 minutes. 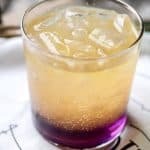 Cut in half and serve! You could warm up some sauce for the side for dipping. I would love to try a veggie calzone recipe next time . . . It can be expensive to fill a calzone craving on a regular basis. 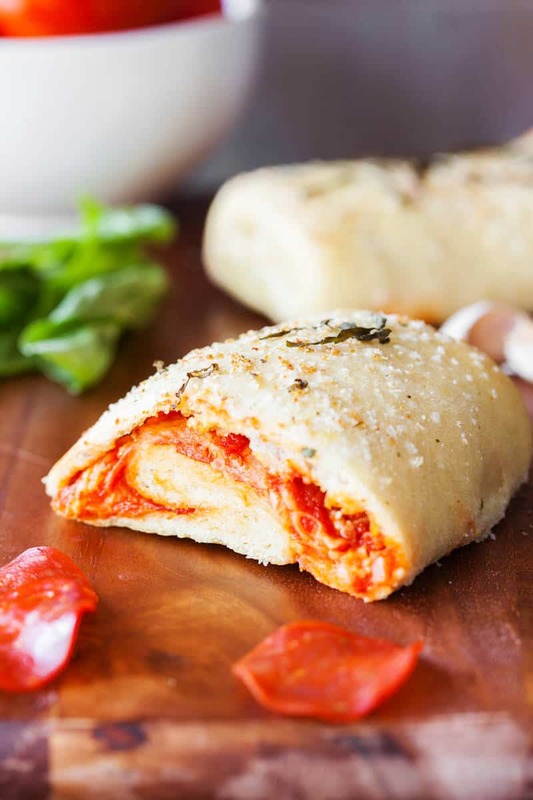 Get inspired by this calzone recipe with no yeast dough - it's so simple and yummy! Mix together in a large bowl flour, sea salt and baking powder. Then add water and mix until everything is well combined and you start to see the dough forming. If using a Kitchenaid mixer, switch to the dough paddle. It will whip everything nicely and you’ll be left with a ball of dough at the bottom of the bowl. Knead the dough for about 2-3 minutes. Sprinkle some flour on your station and some on your dough. Work the flour into the dough so it’s no longer sticky. Separate the dough into two balls. Each ball makes one calzone. 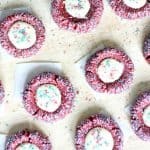 Using a rolling pin, thin out your dough. Start from left to right, then top to bottom until you have a circular or shape. 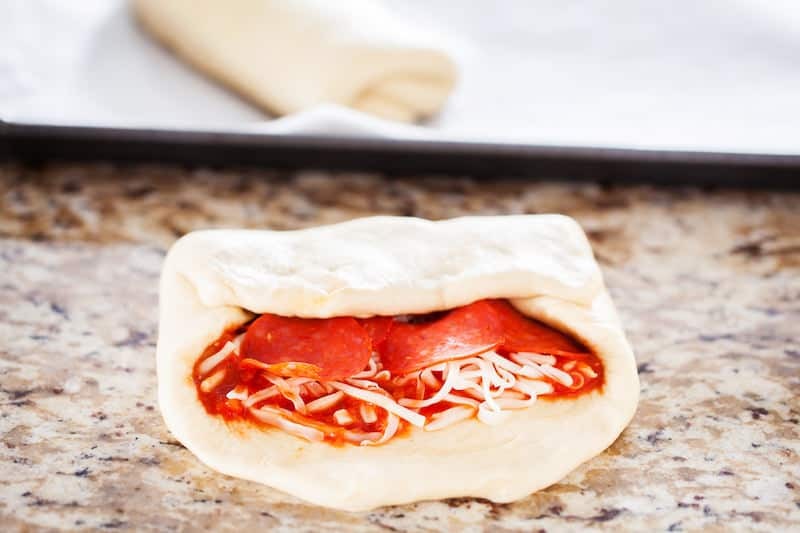 Use a spoon to spread the sauce down in the center of the dough then sprinkle with the mozzarella. Next line up the pepperoni right on top of the cheese. Starting from the bottom, fold the dough about an inch over. Do the same from the top and then fold over the sides to seal the contents. In a small bowl, combine the 1 tsp of oil, garlic salt and basil leaves. Brush the top of the calzone. Bake in the oven on a pizza stone at 350 degrees for 15 minutes or until golden brown. Allow to cool for 2-3 minutes. 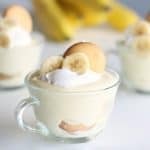 Cut in half and serve!